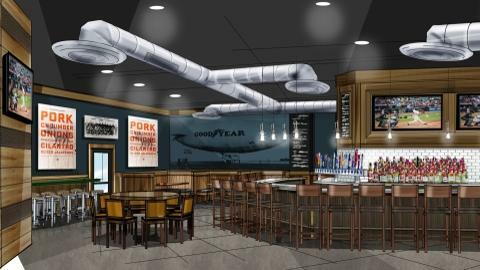 Canal Park's new restaurant will have a full bar in addition to the sit-down, all-American grill-style fare. The yet-to-be-named restaurant will be open for the 2014 season. Even though the theme to the 2013 Akron Aeros' season was "It's a Whole New Ballgame," the changes keep coming to Canal Park with the announcement of a new all-American style grill restaurant, which will be open for the start of the 2014 season. The restaurant will be open year-round and serve a full breakfast, lunch, and dinner menus, including a weekend brunch menu. The food will feature sandwiches, salads, and burgers, as well as some higher-end choices. There will be an expansive bar and the restaurant will have a projection wall and numerous televisions, making it the "ultimate place to watch sporting events," according to Aeros owner Ken Babby in Ohio.com. The yet-to-be-named restaurant is the latest improvement to Canal Park since Babby took ownership of the franchise in October 2012. The big addition last season was the $1.65 million HD video board, one of the largest in all of Minor League Baseball. According to Akron City Council Finance Director Diane Miller-Dawson in Stephanie Warsmith's Ohio.com story, Babby is responsible for repaying the approximate $2.25 million cost of the restaurant that was approved through the Council issuing new certificates of participation. Several area companies have major roles in the project. The construction manager is G. Stephens, Inc.; architect is Caruso Architecture, Inc.; interior designer is Louis + Partners Design; MEP engineering is by Bandwen Williams Kindbom Consulting Engineers; and the structural engineer is Ebersole Structural Engineers, LTD. The restaurant will be located in the right field corner beneath the area formerly filled by Menches Brothers and Wing Warehouse. The upstairs area will be used for indoor group outings, conference meeting space, banquets, parties, and more. Details about the restaurant as well as additional Canal Park improvements will be announced in the coming weeks.